The brain produces activity non-stop. The activity increases with stimuli we can present in the laboratory, such as a picture, a touch or a sound. However, the activity of the brain at rest — the so-called “baseline” activity — may prove to be the most important aspect of our mental lives. Monitoring the awake, resting brain provides information of importance. It has been shown that the baseline activity of the brain uses 20% of the body’s total oxygen, even though it makes up only 2 percent of the body’s mass. The baseline activity may represent the brain restructuring knowledge in the background, simulating future states and events or manipulating memories. Most things we care about — reminiscences, emotions, drives, plans, etc — can occur with no external stimulus and no overt output that can be measured. 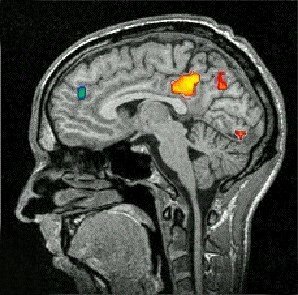 To visualize brain activity, either the baseline activity or activity while thinking or acting something, we use neuroimaging machinery, like Computed Tomography (CT) or Computed Axial Tomography (CAT), Magnetic Resonance Imaging (MRI), Functional Magnetic Resonance Imaging (fMRI), Positron Emission Tomography (PET), Single Photon Emission Computed Tomography (SPECT) or Diffuse Optical Imaging (DOI) or Diffuse Optical Tomography (DOT). In specialized experiments, it could be shown that activity decreases in some brain areas just before a person performs a goal-directed task. The areas that decrease are the same regardless of the details of the task, hinting that these areas may run baseline programs, while the resources are not needed elsewhere. While being awake, information from the outside world pours into the senses (eyes, ears and touch), into the brain and makes itself respectably consciously seen, heard and felt. As this functions properly, many scientists are coming to think that sensory input may merely revise ongoing internal activity in the brain. Note, for example, that sensory input is superfluous for perception: when your eyes are closed during dreaming, you still enjoy rich visual experience. The awake state may be essentially the same as the dreaming state, only partially influenced by external stimuli. In this view, your conscious life is an awake dream. « Can we regenerate brain-matter?